TVforEU is a campaign to highlight the damage that leaving the EU could cause the UK Television and Film industries. The UK is a world leader in post-production, film and television production, visual effects, television broadcast, TV and film equipment manufacture and sales, systems integration and many more related areas employing thousands of people and contributing millions of pounds both directly and indirectly to the economy. We believe that Brexit in all of it's forms is bad for our industry and bad for our country. We're just getting started and need more input. Would you like to get involved and help share our message? Please subscribe to our mailing list here. After consultation with a number of industry folk, the TVforEU campaign wanted to voice the opinions of many people working in Television and Film. There are several industry bodies doing great work, embedded within the relevant government departments, but we wanted to provide a platform for the many individuals and companies who simply wanted to publicly say 'No' to Brexit. 29th of March 2019 is coming fast but there's a lot that can change politically in that time and we need to do everything we can to support our industry. 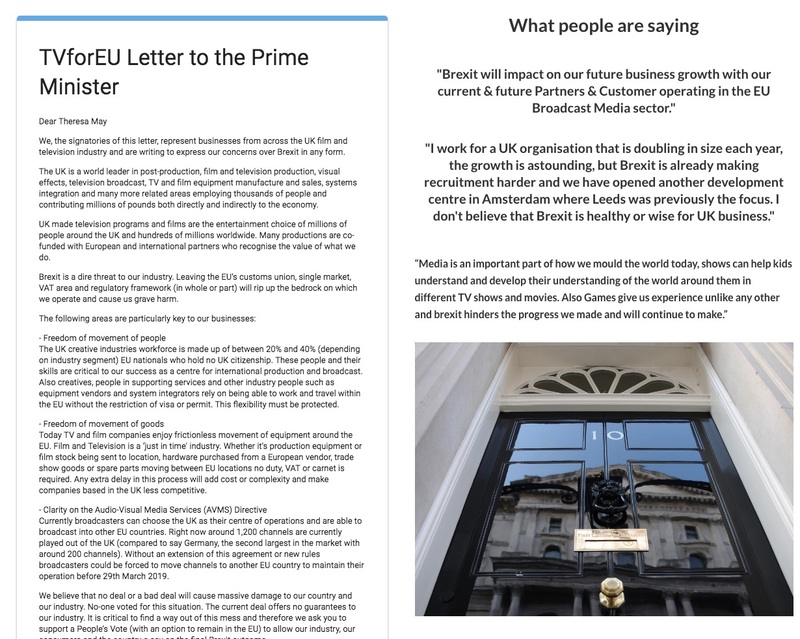 "We, the signatories of this letter, represent businesses from across the UK film and television industry and are writing to express our concerns over Brexit in any form..." Click the button to read more and sign the letter. We need answers on what will happen in the event of the UK leaving the EU. The following items will be hugely significant to the TV and Film industries. Depending on the report and location, the UK creative industries workforce is made up of between 20% and 40% EU nationals who hold no UK citizenship. These people and their skills are critical to our success as a centre for international production and broadcast. Also creatives, people in supporting services and other industry people such as equipment vendors and system integrators rely on being able to work and travel within the EU without the restriction of visa or permit. This flexibility must be protected. Today TV and film companies enjoy frictionless movement of equipment around the EU. Film and Television is a ‘just in time' industry. Whether it’s production equipment or film stock being sent to location, hardware purchased from a European vendor, trade show goods or spare parts moving between EU locations no duty, VAT or carnet is required. Any extra delay in this process will add cost or complexity and make companies based in the UK less competitive. Currently broadcasters can choose the UK as their centre of operations and are able to broadcast and stream into other EU countries (effectively freedom of movement for broadcast services). Right now around 1,200 channels are currently played out of the UK (compared to say Germany, the second largest in the market with around 200 channels). 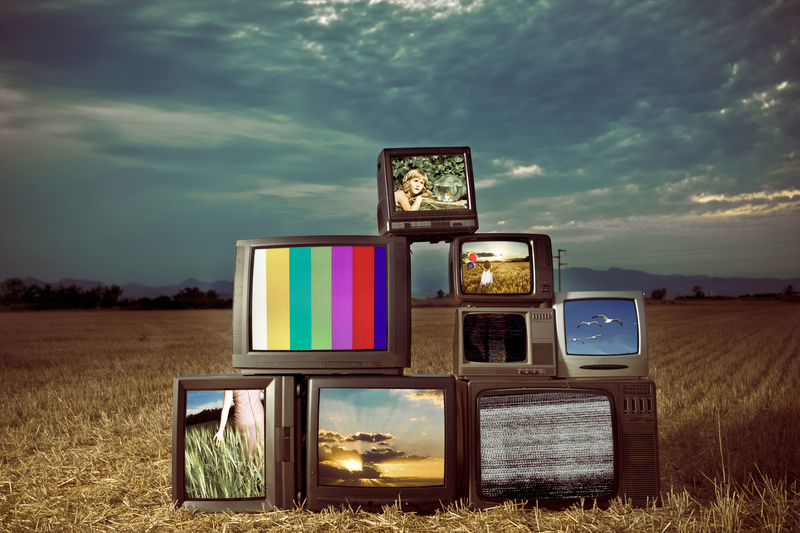 Without an extension of this agreement or new rules broadcasters could be forced to move channels to another EU country to maintain their operation before 29th March 2019. More info here.